Ever heard of a drinkable mosaic? That’s what hundreds of Micheal Jordan’s fans waited long to see finally revealed in an outdoor basketball court, in Chicago’s South Side. To pay tribute to “His Airness” for his induction into the Naismith Memorial Basketball Hall of Fame, Gatorade, the famous brand of sports-themed beverage and food products, teamed up with an advertising agency to create an unprecedented mosaic work. Using 14,641 Gatorade Limited Edition Jordan bottles and 200 lightboxes, the team recreated the portrait of the former Bull’s star inspired by a classic image of him jumping in the air. 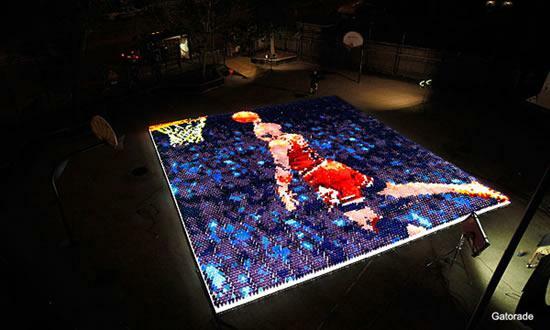 After sixteen hours of work, the giant mosaic was finally taken to the streets to an outdoor basketball court where fans were waiting to see it light up.